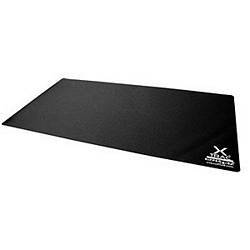 The XTracPads mouse pad uses a nanofiber textile surface that's been scientifically crafted to improve mouse momentum and tracking. Designed for precision, its soft cloth surface is comfortable, extremely durable and easy on your mouse feet. Pros: Feel, Quality, Size, Price. Exactly what i needed. Cons: Smells a little bad when first using it most likely from the rubber. Other Thoughts: I know this is meant to be put on a desk but i am using it on my keyboard tray. my keyboard tray is small and accommodates this pad pretty good. I am using the Razer Copperhead( best mouse ever) and Razer Lycosa. Pros: Size, Size, Size, Sticky bottom. Cons: Edges start falling apart over time. Other Thoughts: Wish the edges of this pad were a little better finished. With time and use they begin to disintegrate. Other than that this is a great Keyboard and Mouse mat.